A study published in the journal Nature announced the finding that the extinction of dinosaurs 65 million years ago had little effect on the evolution of mammals. One theory had suggested that the rise of the mammals was directly linked to the disappearance of the dinosaurs. The evidence to challenge the connection comes from the most complete family tree to have been compiled for mammals. It shows how different groups, such as primates and rodents, are related and when they diverged. An international team compiled the mammalian 'supertree' from existing fossil data and from genetic analyses. Throughout the Cretaceous period, when dinosaurs walked the planet, mammals were relatively few in number, and were prevented from diversifying and evolving in ecosystems which were dominated by reptiles. According to the established view, the extinction of the dinosaurs removed this constraint, allowing mammals to diversify and flourish, and placing them on course for achieving their present position of dominance on Earth. Under this model, placental mammals split into major sub-groupings, which originated and rapidly diversified after the mass extinction event - thought to have been caused by an asteroid or comet striking Earth 65 million years ago (a point in time recorded in rocks and referred to by geologists as the K-T boundary). Co-author of the report, Kate Jones, from the Zoological Society of London, confirmed the traditional view of mammalians rising from the extinction of the dinosaurs. However, she went on to point out the new findings - that the supertree shows that placental mammals had already split into these sub-groups by 93 million years ago, long before the space impact and at a time at which dinosaurs still ruled the planet. 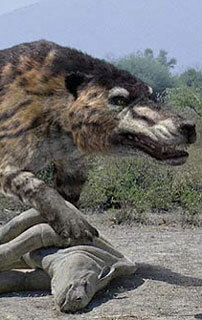 Was it the dinosaur extinction meteor that gave mammals the chance they needed? Following the origin of these sub-groups - or orders - the rate of mammal evolution fell and remained low again until the Eocene, 55 million years ago. The start of the Eocene was marked by rapid global warming and an explosion in the diversity of mammalian lineages. The supertree is a new way of showing all the mammal species on the planet, starting with a common ancestor. Species relationships can be inferred from morphological characteristics and genetic sequences. If this has been done from scratch, the team would have had to get molecular and morphological data for 4,000 different species. What they did instead was to use already-published information from hundreds of researchers around the world. They used a new technique called supertree construction which allowed them to get all of the information available, re-code it, and re-analyse it as if it was all part of one dataset. The composition of rocks and marine sediments laid down at the boundary between the Palaeocene and Eocene epochs show that global temperatures rose by around six degrees Celsius in less than a thousand years - an event known as the thermal maximum. Dr Rob Asher, an expert on mammalian phylogeny at the University of Cambridge, stated that palaeontologists had known for over a century that not all modern placental mammal groups appeared right after the K-T boundary. Most orders of placental mammals appeared in the Eocene. On the flipside, not all dinosaurs disappear at the end of the Cretaceous. There was a timespan of several million years at the end of this period which witnessed several extinctions of non-avian dinosaurs. So the old textbook idea that at the K-T boundary dinosaurs disappeared and mammals appeared is a bit of a straw man. The idea that mammal fossils from the Cretaceous represent ones which are ancestral to today's mammals was a controversial question, according to Dr Asher.